When the angels went away from them into heaven, the shepherds said to one another, “Let us go over to Bethlehem and see this thing that has happened, which the Lord has made known to us.” And they went with haste and found Mary and Joseph, and the baby lying in a manger. And when they saw it, they made known the saying that had been told them concerning this child. And all who heard it wondered at what the shepherds told them. But Mary treasured up all these things, pondering them in her heart. How else can those undeniable experiences of God be described? I have asked and continue to ask innumerable questions about God’s existence, but I have never walked away from an encounter with God with more “answers.” That’s just the wrong category. I get answers from the Bible, but I do not get answers from God himself. I have never walked away from an encounter with God answering everything but rather pondering everything. I’m not firmed up in rigid certainty. I’m opened up in wonder. Having said that, I have attempted to describe what that opening up and that pondering is like. Below is a journal entry that has many dates attached to it, both because of the many times I’ve come back and tried to do a better job of capturing my experience in words, only to be left evermore certain that such experiences simply cannot be so captured any more than a voice can be captured in a photograph or lightening in human hands, but also because in principle it could be attached to any time, any date, I have been encountered by God. Every such encounter takes me back to the first, where I am again a little boy, small, and God is again God—those times I again discover that God is God and I am not. As such, you will have to pardon the apocalyptic tenor of my descriptions, but you’d be better off embracing them. It was on my way from the chapel back to the cabins, a short walk through the woods at Quaker Haven Camp in Northern Indiana. I was eight years old. We had just been released–finally!–from the obligatory chapel session where things were obligatorily said like, “Jesus died for your sins.” The camp director gave us an extra hour of free time until lights-out since it was the last night. Unassuming, I began to hurry back to the cabin to get my flashlight and all-black burglar attire to play capture the flag. Then—I froze. I was stuck staring at something invisible and everywhere, at nothing and everything. It was kind of like the Holy Spirit people at church always talked about, but perhaps more like the Holy Spirit. There were trees. There was transcendence. The earth had lost its horizons. My vision stretched the present into forever and rebounded back. And I saw everything again, as if for the first time. I’m almost tempted to describe it as an “out-of-body experience,” but it was more like the exact opposite. It’s not that I was seeing myself from without so much as I, indeed everything, was being seen, known (something like 1 Corinthians 13:12). But even that doesn’t do it justice, because it wasn’t like discovering the presence of someone who was spying on me from behind the trees. It was more like discovering the presence of Presence itself. I was enveloped, but not I alone. The whole cosmos had been tucked away like a bird hidden in an old man’s inner breast-pocket. It was, in a moment, a rush of Wonder and, in the next, the strike of Revelation. And in an experience of unsolicited arrival, I found myself at the crossroads of a longing I didn’t know I had and a joy I didn’t know I could have, a place I wanted to call home–in the way Peter on the mountain wanted to build three tents. And I may as well have been dead, or I may as well have just been born. I felt like a shadow that had suddenly turned around and discovered just how sad and flat was the world I had been living in all along. I had just stumbled into the living God. It wasn’t an emotion. I did not feel a sensation or get cold chills and my heart wasn’t “strangely warmed.” I knew it in the way you can only know guilt or motive or trust or hope. It is not something you can prove but something that somehow proves you. The thing I distinctly remember thinking over and over was, “God is here.” I don’t mean “thinking” like most thoughts, airy and speculative. I mean the way you might find yourself, dumbstruck, thinking, “A Lion is here,” were you to stumble on one in the woods. And I don’t mean “here” as in “around here” or “here in my heart.” Just “here,” where I was, where the universe was. Also, I don’t mean “God” in any unspecified sense. It was the One they’d named in chapel. It was Jesus, but not exactly the Jesus I’d always known. Jesus had always been floating around in my childhood mind, but so had Ronald McDonald. But in that moment, Ronald remained as statuesque as a Greek god but Jesus had just descended like lightening. So in a rush of greed, like a moth, I extended myself to take hold of him, and then—gone. It had lasted for maybe ten seconds, maybe for all eternity. I couldn’t tell. And I wasn’t even sure it had happened, or I wasn’t even sure that anything else had ever happened. It only now existed as a longing that felt like a bashfully hopeful heartache. I remember trying to adjust my body, refocus my eyes, send my thoughts back to where they just were, run back in time, stop time, start my whole life over so I could run into this Moment again. But I could do nothing of the sort. It was the start-and-stop of wonder in capturing the invisible now, like the moment my kids finally seize a bubble floating about in thin air—the moment they capture it is the very moment it escapes. So that eternal Moment was gone but I was still there—just me and time and the knowledge of an untamable God that cannot be caged. When I convinced myself to let go and continue up the ordinary hill into a now very unordinary world, I felt as if I had stolen something and everyone, indeed everything, became terribly suspicious. The universe had become one giant, illusive conspiracy. It was one big house of mirrors and I had just glimpsed through the only window in the house as the curtain was being drawn. I felt as if everyone either had this shared secret they’d been keeping from me or I had a secret that no one else knew about. But I didn’t know which it was. So I never told anyone. What was there to tell anyway? And who would have believed me? It was a pearl and the disbelieving world was swine. But I treasured it in my heart. I treasured it like a thief treasures a diamond in his pocket, too afraid of being found out to ever cash it in for something else, but never really wanting to anyway. I only wanted more diamonds. I only wanted to discover it again, to try to capture it again, not yet understanding that I would have to be captured by It to remain with It at all. Born in me that day was a deep awareness that something had been found and something had been lost. It was beautiful. It was tragic. It was and would forever hence remain the only longing my soul ever knew, like the pure and faithful longing of my lungs, or the singular longing of loneliness. My only consolation—and perhaps this was just the point—was in this: from that point forward, my Longing had a Name. “Glory to God in the highest, and on earth peace among those with whom he is pleased” (Lk. 2:14). Other than a few proper names, there is no word in my vocabulary more important to me than the word peace. I suppose it is because for a long time I lived without it. Anyone whose world has been stripped of peace knows just how much it’s worth. But defining peace is nearly impossible. This is evident the moment you try to think of its opposite. There’s happy and there’s sad. There’s hope and despair. There’s joy and sorrow, good and evil, heaven and hell, dogs and devils I mean cats. But what is the opposite of peace? Is it war or is it worry? Is it Hostility? Restlessness? Angst? Anxiety? Fear? Bitterness? Hatred? Rage? Violence? Revenge? Discord? Division? Divorce? Chaos? Where is peace essentially located, or not? Is it in the heart or in relationships or in nations or between nations? Is it within or without? Is peace the natural state of affairs or do we, and does our world, default to its opposite, whatever that opposite may be at bottom? Peace is such an all-encompassing word that there is no single word that can describe what it is like not to have it. Nor is it clear how to get it. There are no guaranteed paths that lead to peace, even though everyone is searching for it in one way or another, or perhaps running from its opposite, but there simply is no predictable profile of a person who has it or does not. We may have all been able to guess that Kurt Cobain struggled to find peace, but Robin Williams? Those at the top of the ladder are just as potentially bankrupt as those at the bottom. Perhaps, then, there is no definitive opposite of peace to speak of, only its definitive absence. It is surely the case that no matter how many things a person might have, to have no peace is in a certain sense to have nothing. I do not mean to not have anything but to have precisely nothing: an inescapable void right at the center of everything else, like the billions of stars in our galaxy that all have a supermassive black hole churning at the center. It is indeed the absence of peace that sets much of our world in motion, into commotion. Everyone is searching for its presence (or running from its absence) but more often than not search (or run) in vain. The absence of peace cannot be filled with any substitute presence any more than a black hole can be filled with starlight. It’s almost like the absence of a person. The only thing that can fill the absence of a person is that same person’s presence. There is no replacement for peace. In the Bible the absence of peace is, in fact, a personal matter. There is a hole in the heart of the world. God made the world to be especially present to it, in it. After breathing the universe into being and hanging the stars and planets up like nursery mobiles on natural laws, he picked one planet to fill personally with his presence. Apart from his presence “the earth was without form and void and darkness was over the face of the deep” (Gen. 1:2). The formless void is creation with no particular reference points, no special order, no governing Lord, like the raging the storms of Jupiter or the searing surface of Venus. The laws of nature may be able to loosely hold things together but they cannot put life together in the least. Special attention is needed. A Person is needed to make persons. The world apart from God is utterly indifferent to life. So God intervenes, bringing order and giving form, filling the void with his presence and human beings with his blessing, completing his work by entering with them into a state of rest (Sabbath) (Gen. 1:1-2:4). The world with God is utterly at peace. He had given dominion to human beings to govern the world in his image with his presence under his guidance. But they abused their power, seeking to become gods in their own image, and thus turned away from the presence of God (Gen. 3). It was not long before all creation all but returned to a formless void: “In the six hundredth year of Noah’s life…on that day all the springs of the great deep burst forth, and the floodgates of the heavens were opened” (Gen. 7:10-11). It wasn’t that God caused something unnatural to happen so much as it was that he allowed nature to take its course. He had separated the waters in ordering creation to make an oasis of life (Gen. 1:7). Judgment was simply a matter of withdrawing his sustaining hand. And in the book of Revelation, the rider on the “fiery red horse” did not bring judgment by wielding his own sword. He was simply sent “to remove peace from the earth, so that men would slay one another” (Rev. 6:4). Men apart from God are utterly indifferent to life. The natural world and all that is in it defaults to chaos in God’s absence. There is no more terrible a prospect of God’s wrath than God’s absence. Perhaps, then, peace does have a definitive opposite in that it does have a definitive absence. The opposite of peace is godlessness, in a literal sense. In the words of Karl Barth, “The enterprise of the No-God is avenged by its success.” So if you want to find peace, you have to go straight to the source. There is no replacement for God. About five years back, Keldy and I were meeting regularly with a young gal helping her through some of life’s regulars, a few irregulars as well. One evening we had one of those rare “come to Jesus” moments, because it was pretty clear Jesus had come to her. There were tears, confessions, a white flag slowly being raised from her heart. But I could tell there was still some white in her knuckles as it related to one very destructive relationship she knew she needed to let go. I tried to convince her that staying in this relationship was like holding on to a ticking time bomb. I’ll never forget her response: “I’d rather die with someone who hurts me than be left alone. I just don’t want to be alone.” For this girl, it wasn’t a presence she feared, no matter how destructive, but an absence. I can’t say that I blame her. I know what all sorts of pain feels like, and there is no pain that hurts more than loneliness. Indeed, “it is not good for man to be alone” (Gen. 2:18), so we would rather die with the ones who hurt us than be left to live alone. But that’s not our only option. A few years later I got a text from the same girl. It’d likely been a year since I had talked to her. She was off to college and I had, quite frankly, given up on her. But Jesus hadn’t. “The Spirit of truth…is with you, and he will be in you. I will not leave you as orphans; I will come to you…Peace I leave with you; my peace I give to you. Not as the world gives do I give to you. Let not your hearts be troubled, neither let them be afraid. You heard me say to you, ‘I am going away, and I will come to you…I have told you before it takes place, so that when it does take place you may believe'” (Jn. 14:18-29). Jesus gives us his peace not as the world gives. That means, you don’t have to keep chasing empty promises and following false pursuits. Perhaps the best thing you could do is acknowledge the fact that you’re likely not running to something so much as you are running away from something. Perhaps you could face the absence square in the eye and fill the void with the Name of Jesus, calling on him to do what only he can do: to fill the absence in your life with the Person you are running from. There simply is no replacement for Peace. there will be no end” (Isa. 9:6-7). and on earth peace among those with whom he is pleased!” (Lk. 2:8-14). Awhile back a well-meaning man and his son knocked on my door, awkward, tracts in hand. Below is the conversation as I remember it. I don’t think it is far from verbatim. Now, to be clear, I believe hell will be populated aplenty, and I reject the notion that God forces anyone or everyone to embrace his love and respond in love. That just ain’t how love works. But I also reject the notion of a Gospel that is grounded in heaven-and-hell and not in Jesus Christ, because that is not the Gospel found in the Gospels, nor the one proclaimed in the New Testament, and I remain ever more committed to the Gospel found in the Bible than the one found in contemporary Christian evangelicalism, or contemporary Christian liberalism for that matter. In the book of Acts, for example, the New Testament book that should be used above all as the Church’s model for evangelism, the word “hell” (Grk. Gehenna) is never used. Not once. The word Hades, on the other hand, is used twice, but it is not used to refer to the place people who aren’t saved go when they die; it’s used to refer to the place Jesus went to save people when he died (Acts 2:27, 31). That should matter. That should shape the way we think about what the News actually is and the way we articulate it to the world to which we’ve been sent to announce it as Good. “I determined to know nothing among you except Jesus Christ and him crucified…my speech and message were not in plausible words of wisdom but in the demonstration of the Spirit’s power, so that you faith might not rest in the wisdom of men but in the power of God (1 Cor. 2:2-5). The Apostles simply focused on the Person of Jesus Christ and trusted that the Holy Spirit would empower their message, so long as their message remained faithfully Christ-centered. So whatever else we might conclude, we must conclude that the Good News of Jesus Christ is Christ-centered, not hell-centered, or even heaven-centered for that matter. It centers on a Person, not a place. By promoting a place-centered gospel, heaven becomes the goal, at best, and Jesus becomes a mere means to an end. At worst, the only goal is to get out of hell, and Jesus becomes a cheap deal on fire insurance. We may end up with more buyers selling cheap fire insurance, but we may also end up with more people in hell. Jesus said to them, “It is not for you to know times or seasons that the Father has fixed by his own authority. But you will receive power when the Holy Spirit comes upon you and you will be my witnesses in Jerusalem and in all Judea and Samaria, and to the end of the earth” (Acts 1:7-8). The bottom line is this: the Good News of Jesus Christ is not about how fear-worthy hell is and how afraid we should feel about it–-that’s just not the point; it is about how love-worthy God is and how grateful we should be for his grace, and how eager we should be for him to return. It is not that one day we will float off into a wofty cotton field. It is that one day Jesus Christ will come back to earth to establish his throne on earth as it is in heaven, to which our unending response will be to worship with the angels on earth as they do in heaven (Rev. 4; 5:1-14; 7:9-17; 15; 19:4-8; 22:8-9). Place-centered eschatology (study of “last things”) leads to man-made ideals of paradise. It’s what, for example, both Muslim and Mormon eschatology embraces, and precisely because they desire to be liberated from their gods. Who can blame them? But if we think heaven is the place where we will finally have our way and God will finally leave us alone, then we may be in danger precisely of getting our way and finally being left alone: we may be in danger of going to that heaven, which is another way of saying going to hell. But Christ-centered eschatology leads to worship. Christians (should) know that paradise is only paradisiacal because Christ is at the center, on the throne, and we are there with him, on our face. “And while they were there, the time came for her to give birth. And she gave birth to her firstborn son and wrapped him in swaddling cloths and laid him in a manger, because there was no place for them in the inn….And in the same region there were shepherds out in the field, keeping watch over their flock by night. And an angel of the Lord appeared to them…and the angel said to them, “Fear not, for behold, I bring you good news of great joy that will be for all the people. For unto you is born this day in the city of David a Savior, who is Christ the Lord. And this will be a sign for you: you will find a baby wrapped in swaddling cloths and lying in a manger.” (Luke 2:8-12). A lot of people talk about “seeking God” as though on some open-ended quest toward an infinite horizon. 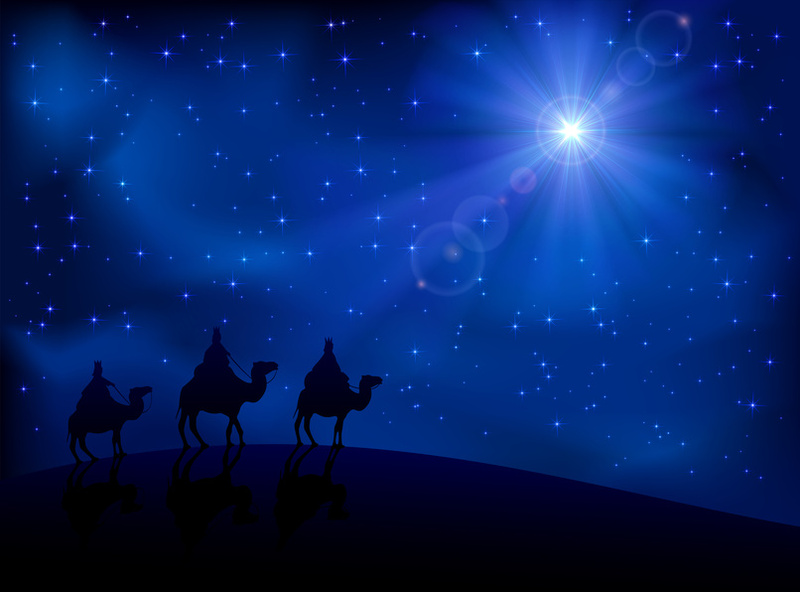 But when the shepherds, who had just seen the infinite horizon rend with songs descending, were told to seek God, they were also told they would know they were on the right track when they received another grandiose sign from on high: a baby born in a barn. Imagine how much bigger and more mysterious the world must have been before it got entangled in the World Wide Web, a world without Buzzfeeds that reduce our ordinary world to a series of tragic or trivial headlines and Newsfeeds that reduce our social world to a series of one-way conversations 140 characters-deep and 10,000 friends-wide. Imagine a world without Google Maps and Google Earth and Google Sky and Google Multiverse (forthcoming). Imagine what it must have felt like to not feel like you are at the center of the earth or the center of every event and every relationship on earth. Imagine a world with board games and the great big woods outback. I wonder what it felt like to be as small as a human being? Just as a thought experiment, go type “headlines” into your search engine of choice. Read the headlines. Then ask yourself the following question: “What can I do about this?” I’m thinking of specific actions that can actually address specific problems or make specific differences in my life or anyone else’s. There it is, folks, the “news.” These are the new things happening all over our world. Behold the newness of it all. there is nothing new under the sun” (Eccles. 1:9). Just because it’s a headline doesn’t mean it’s important, that it rightly demands your attention, that it can add to or take away from your hope, that it actually deserves to be regarded as “news.” The vast majority of information that comes through the news media serves to do little more than form cultural attitudes (cf. G.K. Chesterton’s sobering work, What’s Wrong with the World). It’s spectacle, a coliseum at our fingertips. But it is certainly not news in any real sense of the word. It’s just an ever-expanding buffet of rearranged words that are used to say the same old thing over and over and over ad infinitum. It’s like Mexican food. There is nothing new under the sun. We’re just moving around the rice and the beans. The unquenchable fires of the nightly news feed only on the world of decay, a world that requires the new to ever become old, a world that skims atop the surface of time desperately groping at what men identify as meaningful today but what moth will identify as food tomorrow. But Christians have been given a cross staked into history’s yesterday and Life raised up into history’s Tomorrow. That news has pierced the soul of the world, and it is the one thing that remains new precisely because it is the only thing that never grows old. It is the news that the angel heralded over history as “the eternal Good News…to every tribe, tongue and nation” (Rev. 14:6). It’s the eternal good news because it’s the news that makes all things new. loved mankind…but…the more I love mankind in general, the less I love people in particular. I often went so far as to think passionately of serving mankind, and, it may be, would really have gone to the cross for people if it were somehow suddenly necessary, and yet I am incapable of living in the same room with anyone even for two days; this I know from experience. As soon as someone is there, close to me, his personality oppresses my self-esteem and restricts my freedom. In twenty-four hours I can begin to hate even the best of men: one because he takes too long eating his dinner, another because he has a cold and keeps blowing his nose. On the other hand, it has always happened that the more I hate people individually, the more ardent becomes my love for humanity as a whole (The Brothers Karamazov). The problem with actual human beings, the kind that bleed real blood (Jn. 19) and eat real fish (Jn. 21), is that they get in the way of human ideals, especially our ideal of humankind. That’s why human beings are most hateable precisely in the name of humankind. We hate Hitler so much because we love humankind so much. But if it is an ideal of humankind we are after, we are better off leaving this world to find it. If God himself cannot fix the world without first getting caught up in the thickets of its realism, then neither should we imagine an ideal world void of invasive thorns and corrupted crowns, or of some strange combination of the two. Till kingdom come in all its fiery cleansing, humans will continue to erect crosses and blow their noses. And unless we are going to join the effort of the ones holding the hammers, joining the effort of the One holding the nails will always feel small and personal, and likely at least a pain in the neck. The truth is, you can’t make your world different until your world becomes close enough to touch, low enough to look in the eye. That is your world. Everything bigger is a mirage. Anything more important is unimportant. And strangely enough, it is in that little insignificant world of yours, too small to see through a screen, that you will find meaning, purpose and permanence, because it is in that world that you will find God. The shepherds found God in a makeshift cradle, after all, and God Almighty himself said he’d continue to be found in little unlikely places like prayer gatherings (Mt. 18) and prison ministries (Mt. 25). This point is this: it’s easier to care about everything in the world than to care about one single human being. At least as far as the Church is concerned, we don’t need more initiatives than the one we’ve inherited. We just need to take the one we’ve inherited seriously. But that requires believing in a very large gap between the size of your efforts and the size of the difference it makes, but it also requires disbelieving in the size of Washington and Hollywood, so that you don’t waste all your efforts trying to change one and look like the other. You can do no such thing, not in the name of the Gospel of God’s kingdom, at least. But the Gospel frames the divine revolution of God’s kingdom in mustard seed packets. And these mustard seeds are not like Jack’s beans. They don’t magically produce watermelons on vines of Zigguratic proportions. The difference is both bigger and smaller than that–it just depends on how you measure, and I can’t help but think that the Church’s measuring sticks need about as much conversion as the Church’s nonmembers, and exactly as much as its members. Unfortunately or not, the magical mustard seeds of the kingdom turn out merely to produce more mustard seeds (Mt. 13:31), which is precisely the way love works. Loving people in Jesus’ name rarely ever produces mass conversions or a moral majority. Most of the time loving people in Jesus’ name just produces more people who love people in Jesus’ name. And that’s how the kingdom of God has been forcefully advancing for over 2,000 years, longer than any nation has been in existence, and will continue to do so longer than any nation will remain in existence. And this is actually actionable for everyone, because people really only need moderate amounts of love. What I mean is, people do not need love from the whole human race or even the whole federal government; they just need it from you. In fact, you are the only one small enough to love with a God-sized love. A cup of cold water in Jesus’ name will always be more satisfying than a free pass at the fire hydrant. A pro-life rally will always be less effective than taking a troubled young teen out for ice cream. And if you want to love a refugee, find one. If you can’t find one without a country, find one without home, or one without a father, or one with a father who may as well not be a father. They are everywhere, especially right next door. If you want to be “missional” and save the world, just make sure whatever world you intend to save is one inhabited by human beings as real and as small as you are. Even if God sends you across the globe, it will only be in order to send you across the street. But he doesn’t have to send you across the globe to send you across the street, so please don’t wait until you are called overseas to the nations to call the neighbor next door. If you are committed to becoming part of something as small as God’s global mission, going around town proclaiming “good tidings of great joy” to little kids and boring neighbors, I can promise that you’ll encounter Jesus as you go. Sometimes that will be as sweet as Christmas morning, other times as sour as a sponge dipped in vinegar, but if we are going to grow in the Hope of a Christmas kingdom, we’ve got to be willing to walk away from the starry evening angels and follow the light that leads to the manger, precisely where no one else is paying attention—because God cares about the people who are paid no attention, people like you, people like me. So be small, and know that God was too. May I offer a simple way to stay grounded in the kind of Gospel that actually touches the ground? Think about a time you received the grandest expression of love you’ve known: now go, descend from on high, and do likewise. But this was my first time meeting Joyce. I think Joyce is young, perhaps in her late thirties, early forties, but it’s hard to say. The age of her hair doesn’t match the number of years under her eyes. I’m afraid she has the quality of a face that has learned to love everyone but herself. She is quick to smile, even quicker to look down. Her eyes sink with her shoulders, low. When I sat between her and Mary on Monday she was accommodating. Mary did the ritual with the phone and the picture. “I can see it,” Joyce convinced herself. (I look absolutely nothing like Dave.) We then began sharing our stories across the table. It turns out Joyce “grew up in this church. This is my church.” A number of churches had in fact passed through the building, but she knew her church as this building. I know, I know. “The church is the people, not the building.” But the fact is, the faithfulness of the building almost always outlasts the faithfulness of the people. People had not always been there for Joyce, but this building had. This was Joyce’s church. She spoke about her early days in the way you hear parents talk about children growing up too fast. Her words ached. They made me ache. I’m not entirely sure why, but I think it had to do with the thought of Joyce-the-little-girl running up and down the halls and playing in the sanctuary. It had to do with the thought that there was a time when Joyce had a sanctuary. And it was the awareness that at some point along the way something happened to her, and that sanctuary was gone, or at least the girl who used to play in that sanctuary was gone. And maybe it also had to do with the memory of Jeremy-the-little boy running up and down the halls in the sanctuary of the place I called ‘my church’ growing up. But the church I grew up in is now part of an irreversible and irretrievable past that I remember with the same ache in the deep part of Joyce’s eyes and the lost part of Joyce’s words. There was a time when I had a sanctuary, when I was a little boy at home in God’s big house. But at some point along the way something happened, and that sanctuary was gone, and that little boy decided to leave home and grow old. I have so longed to go to that little boy and reassure him, to get him to turn around, to stay, but I cannot. He is back there with that little girl. And now, here we are, older, lower. “What did he say, Joyce?”, I asked. I don’t know what that meant to Joyce, but I know she heard it. I know she believed it more than I think most people ever believe anything. I think she believed in those words more than she believed in herself. She believed it like she had to believe it, like if it weren’t true nothing is true, like if there’s no hope in what God is going to do then there’s no hope at all. I also know God said it to her, because that is the kind of thing God is always saying (cf. Phil. 1:6). But it’s something God says on a low frequency. It’s hard to hear God’s hope for the humble when you’re on top of the world, God’s hope for the future when you don’t need Him right now. When It first arrived, Caesar didn’t hear it. Pilate didn’t hear it. Herod didn’t hear it. Annas and Caiaphas didn’t hear it. Scores of scribes and Pharisees didn’t hear it. But Mary heard it. Elizabeth heard it. A peasant named Joseph heard it. A few pagan astrologists (the magi) and some fishermen heard it. Five-men’s-ex-wife-at-a-well and a woman caught in adultery heart it. The town drunks and tax-collecting traitors heard it. A thief on a cross heard it. All the children of the world heard it (Mt. 19:14; Mk. 10:15; Lk. 18:16). They all heard what God said to Joyce. It’s the message of Advent: I’m not done! The message of Advent is nothing if it is not hope in what God is yet going to do (1 Cor. 15:16-19). The world affords no shortage of false hopes, and sometimes we have to be stripped of them all before we find ourselves hoping in God. As Holocaust survivor Corrie Ten Boom once wrote, “You may never know Jesus is all you need until Jesus is all you have.” But the good news is this: we do have Jesus, we do have hope. For Christ has come—and Christ is coming again! So lay low, and keep listening. God put a rainbow in the clouds. “In those days Mary arose and went with haste into the hill country, to a town in Judah, and she entered the house of Zechariah and greeted Elizabeth. And when Elizabeth heard the greeting of Mary, the baby leaped in her womb. And Elizabeth was filled with the Holy Spirit, and she exclaimed with a loud cry, ‘Blessed are you among women, and blessed is the fruit of your womb! And why is this granted to me that the mother of my Lord should come to me? For behold, when the sound of your greeting came to my ears, the baby in my womb leaped for joy. And blessed is she who believed that there would be a fulfillment of what was spoken to her from the Lord” (Lk. 1:39-45). I arrived back home in North Carolina yesterday to visit family en route to our new home in Washington State. I wasn’t certain I’d ever get to see my grandfather again. My mom has been taking care of him for the last fourteen years. He’s 95 (now 97, still kickin’). We came here a few months ago not knowing if he would make it through the night. But he seems to have found a second wind—for the thousandth time. So today I got to introduce him to my perfect daughter, Radley, his newest great granddaughter. As soon as he saw her he lit up with buckets of light and began to giggle. When we put her on his chest his laughter and light and life just spilled out all over the place. Mom and I got caught up in the moment. Everything did. We were laughing, they were laughing, the room was laughing, all the children of the earth and all the angels of heaven were laughing. The cosmos itself had cracked open in a fit of sidesplitting joy. I suppose it was really just a very old man who has lost most of his mind amused by a very young girl who has yet to find most of hers. On the surface at least there wasn’t a shred of evidence of anything out of the ordinary, not even a speck of angel dust. And since humans typically forget to look beneath the surface, these aren’t the types of experiences we spend our lives pursuing or filmmakers spend millions of dollars trying to recreate. It wasn’t exciting, it wasn’t dramatic—and what even was funny? And yet, there we all were, swallowed up in the most naked and sincere laughter. It was somehow both forgettably unassuming and borderline apocalyptic. It was something like the Incarnation, the day the infinite God squeezed himself into everyday life and was “wrapped…in swaddling cloths and laid…in a manger” (Lk. 2:7). And it was exactly like every experience of God I’ve ever had. I have personally never had an experience of God that was visible on the surface in any real measurable sense, like a person’s stump growing back into a leg or an Egyptian river turning into blood. But I did just two weeks ago hold out my hands and receive my daughter into this world. I did just this morning look down at her face and see her looking up at mine. I fully believe God has and will continue at times to use Nile-sized miracles to reveal his unlimited power, but I do not believe that is what he is ordinarily most interested in revealing. I think he is still most interested in revealing himself through miracles the shape of the Incarnation, the truly God showing up in the truly human, like infants and old people, precisely because he wants us to pay attention to infants and old people, the least and the last—one of the only places we are ever really guaranteed to find him (Mt. 25:31-46). And that’s the only real surprising thing about God. No human has ever struggled to believe that God could be just as powerful as a god, but we have all struggled to believe that God could be just as powerful as a baby. It was just this kind of disproportionality in the moment that suggested God was in the room. The two mismatched mothers-to-be, one too old to be a mother, the other too chaste to be a mother, standing belly against belly, giggling their way into a prophetic frenzy. It’s the kind of scene that can’t really be seen through the windowpane. You’ve got to enter into the miracle to see the miracle. You can’t hear the angels laughing until you start laughing. The waters only part when you step irreversibly into the flood (Josh. 3:11-16). It’s like the flag-wavers at church who are genuinely dancing in the Spirit while everyone else is genuinely distracted by the flags. The only way to ever start dancing in the Spirit is to start dancing. By this point, Mary and Elizabeth and their unborn babies were all dancing around the room, “filled with the Holy Spirit” and “leaping for joy” (Lk. 1:41-44), while the whole world looks in through the glass. But from out here it still looks like little more than two women filled with child and a little too much wine. Until Mary opened her mouth and thunder came out (Lk. 1:46-55). There, with only a one-cousin-congregation, Mary stood up on the bar stool, raised her glass, and gave the most revolutionary speech in human history, the ‘Magnificat’, announcing that the Divine revolution had begun—in her belly. Granted, it was still in its embryonic form, a revolution that could still legally be aborted in our world, and sometimes it felt like little more than acid reflux, but it was here nonetheless. God was here. Emmanuel—in utero. God refuses to be found in the places we insist on looking for him. The center of Israel’s temple and the top of Babylon’s tower both turned out to be empty. The farther away humans ascend from the world of the least and the lowest, the farther away they get from the world of the Most High God. The Incarnation reveals that there are a number of things humans care about that God doesn’t care about and there are a number of things God cares about that humans don’t care about, like infants and old people. Indeed, before “a Child to us [was] born” (Isa. 9:6), an unborn child to Mary was conceived. Surely God cared about at least that unborn Child, even before he was “viable.” And God made sure his mother was not sent to a nursing home just before he was laid in a tomb. Jesus loves the little children. Jesus cares about the old widow. I once heard a wise man say that the health of a society can be measured largely by how its people treat the very young and the very old. The rapid emergence of abortion clinics and nursing homes in our society must say something about how we’re measuring up, or not. Not that nursing homes serve the same function as abortion clinics, but many who end up in nursing homes have been aborted all the same. At any rate, there is certainly something sickly about a society that struggles to find the value of life apart from its utility, its ability to produce and perform. There is something broken in a society that believes it owes nothing to the generation it depended on for life and feels justified in terminating the generation that depends on it for life. We are nurturing a social infrastructure that is effectively severing the life cycle at both ends, precisely where humans are most vulnerable, the least and the last, buffering our illusion of immortality, cultivating values that are not only inhumane but quite literally inhuman (cf. Ernest Becker’s The Denial of Death). We’re not taking care of ourselves. We are rejecting our former selves and rejecting our future selves, willfully neglecting the fact that we all were once the least and will all eventually join the last. And, at the end of the day, our refusal to live with “the least of these” is not only a rejection of our humanity, it is a rejection of our God (Mt. 25)—it is a rejection of Christmas. And for that reason, for the sake of Christmas, the Church simply cannot accept the status quo. We must embrace our humanity the name of the Incarnation and thereby embrace our God. We must embrace all of human life as sacred, lest we lose all the sacredness of human life. God-with-us began with an Unborn and remains with us unto death–precisely so that we can remain with him unto Life. Most of the time God-with-us feels more like us than it feels like God. Most of the time it feels exactly as miraculous as taking care of people who can’t take care of themselves, like changing the diapers of ancients and infants. Most of the time the Incarnation just feels very carnal. But then there are times, right in the middle of the mundane, right between the two women feeling each others bellies, right between the face of an old man and the helplessness of a little girl, the heavens opens up and the splendor of the living God fills the room as the waters cover the sea. And you can’t help but laugh, because it feels just like Christmas. “When Joseph woke from sleep, he did as the angel of the Lord commanded him: he took his wife, but knew her not until she had given birth to a son. And he called his name Jesus” (Mt. 1:24-25). [At this juncture, to avoid an altogether unnecessary rant please skip to the next paragraph.] It’s not even a love-hate relationship, like “I love the benefit flying affords the modern-day traveller but hate this or that aspect of airports.” It’s a pure hate-hate thing. I know it’s unreasonable, I know I’m a hypocrite because, yes, I will continue to travel long distances by plane rather than car or covered wagon, but still, I hate it all: the busyness, the restlessness, the confusion of constantly rushing and waiting all at once, taking my shoes off and laptop out, stickin’em up for that virtual strip search machine, the not-reclining until it’s somehow magically safe to recline upon reaching 30,000′, the speech about using the seat as a flotation device in the event that the plane nosedives 30,000′ into the earth, people in front of me reclining, the people in first class (it’s not you, it’s me), the in-flight smells, my borderline-claustrophobia-compounding-the-in-flight-smells, the blow-the-speakers loud *ding* followed by some redundant announcement and sometimes followed by nothing at all (especially on overnight flights—why?) other than thoughts better kept to self, the dried up snot, the ear issue, the $4.00-bottled-water-that-I-will-never-buy-but-over-which-I-insist-on-being-disgusted, the fact that somehow my departure gate is literally always at the absolute farthest end of wherever I happen to be at any given time in any given airport (and, for that matter, the fact that my invariably delayed flight(s) leave me (and my almost invariably pregnant-or-nursing wife and however many children I happen to have at the time) approximately 20 minutes to make it to the next departure gate (after taxying on the Tarmac for half an hour, waiting at least 10 minutes for the you-can-all-stand-up-now-and-wrestle-reach-for-your-carry-on-luggage-in-the-overhead-bin-at-the-exact-same-time-and-then-stand-there (touching…everyone is touching)-and-breath-down-the-back-of-the-person’s-neck-in-front-of-you-who-leaned-back-on-your-lap-all-flight-as-you-deplane *ding* to go off, waiting another 10-20-30 minutes for everyone else to deplane because I have too many kids to make hurrying a reasonable option)–I could go on, but I don’t want to belabor the point. More than anything, though, the reason I hate airports so much is that I love control so much. And most of that unnamable airport angst that I blame on any number of things (see rant above) is really caused by having lost all sense of control. People who love control hate losing their sense of control. This becomes most evident to me as I’ve noticed that something so banal as driving suddenly becomes the most satisfying experience of my life when I’m driving home from an airport—the feel of the (over-gripped) steering wheel, the feel of the (over-depressed) gas pedal, the cracking sound of whatever song I choose to blast through my (now blown) treble-heavy minivan speakers, the sense of immediacy between cause and effect, the sense of agency, the satisfaction of speeding and unnecessarily changing lanes and turning corners like Richard Petty in a stolen Honda Odyssey. Control. Actually, I should say that I love the illusion of control and that commercial flying is always an active exercise in disillusionment. There’s typically no one you can blame and nothing you can do to actually change your circumstances in an airport. You are just a cog in a system of ever churning wheels: small, out of control. And that’s truer of everyday life than we’d like to admit. In everyday life where we drive cars and keep day-timers and make appointments–-and sometimes delay appointments and cancel appointments and live as godlessly as your everyday airport antics–-we find all sorts of people to blame and all sorts of things to do to bolster our illusion of control. But blaming a person can never change a person and the things we do rarely change what we most need to change, which happens to be the only thing we have any real power to change, namely ourselves. I can’t change, for example, flight delays and my flight attendant can’t either, but I can change my attitude toward her. I can treat her like a human being stuck in the same complex set of circumstances outside any- and everyone’s control. And perhaps that’s just the point. Perhaps God uses all the stuff we wish we could change but mostly can’t to reveal what he wants to change in us but often won’t–-because we won’t let him, because that would mean giving up what little control we actually have. Consider marriage, for example. Hypothetically speaking, of course, there are at times all kinds of inner violence and turmoil and shame and discontent in my soul for reasons known and unknown. At the end of the day, most of that inner stuff is there because, directly or indirectly, I put it there and I store it there for safekeeping. Now, there are plenty of things within my power I can do change myself. I can, in the first place, confess out loud my sins to Jesus, who alone has the power to change me, and confess to my brothers and sisters in Christ, who can hold me accountable and hold my feet to the fire from time to time. I can humble myself and confess to my wife all that inner stuff that all too often comes out as irritability or coldness or withdrawing and almost always comes out as some form of blaming or projecting. I can recognize that she is 97% light and when I insist on seeing her 3% darkness what I’m really seeing is a mirror image of most of myself. What I’m really seeing is not something in her soul but something in my eye, not her speck but my log (Mt. 7:3-5). And perhaps the reason I insist on seeing that is because as long as the problem is located in her I don’t have to deal with the problem located in me. But that’s the only problem I really can deal with. I am out of control of everything else. In fact, it has only recently dawned on me that while I’ve spent most of my life trying to transform my circumstances, God has spent most of my life using my circumstances to transform me. I’m the circumstance that needs to change. I’m the bad attitude that needs to change the circumstance of the flight attendant having to deal with with an ungrateful patron. I’m the judgmental eye that needs to change the circumstance of my wife having to deal with her hard-hearted husband. I’m the short temper that needs to change the circumstance of my kids having to listen to a father who yells. I’m the greedy hands that needs to change the circumstance of a world who needs more open-handedness. I’m the problem. And If everyone on earth would take responsibility for that problem and focus on the changes needed to address it, perhaps the world truly would be changed. Perhaps airports wouldn’t be so miserable (they probably still would). But ultimately we can’t fix even that problem. We can’t really, fundamentally, change ourselves. We can, however, go boldly to the only One who by the power of his Spirit can and will change us, if we will be honest about our need for change and stop projecting it on the world in need of change. But to do that we must confess that we are broken, that we need changed, that we are the problem. And so that is my confession this morning. I am broken, I do need changed, and I am the problem. So what did Joseph do about his circumstances? He didn’t complain. He didn’t demand his money back. He didn’t become an embittered passive-aggressive husband who treats his wife as a conjugal object of his gratification. “He did as the angel of the Lord commanded him: he took his wife, but knew her not until she had given birth to a son. And he called his name Jesus” (Mt. 1:24-25). Receive email notifications of new publications.